One day, THISsheep, an orphan lamb, found his way here from a friend’s flock. A sassy little black Border Leicester with just a few white hairs in a funny little circle on his forehead. For many years we had a ewe named Kelly. She arrived all the way from Pennsylvania with a broken hip that had healed crookedly, leaving her with a limp. She was unable to be out with our big group of sheep so she had a smaller pasture with a few older, quieter sheep to keep her company. Kelly was afraid of people but she adored lambs. Absolutely. She took over raising this cute little lamb even though we were the ones serving up the bottles. He grew up racing around with a gaggle of other orphan lambs, then flopping down into a pile on a blanket to nap until the next big race or game of tag. Border Leicesters are an historic English breed. 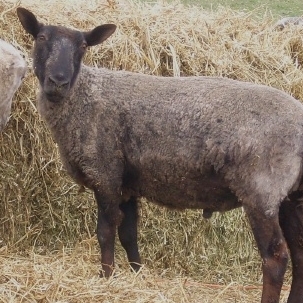 We always try to name our sheep for what we see in their personalities or breed traits. So off I went to research names. Warrick. In English means ‘fortress.’ In its Germanic roots it means ‘protecting ruler.’ It seemed like Karma to me that this name not only reflected my family’s English roots, but also the German. So Warrick it was. What a big name to put on that scamp but he grew right into it. I love all sheep with all my heart. However, there is something different about a Border Leicester. They are elegant, serene and very striking within a flock. 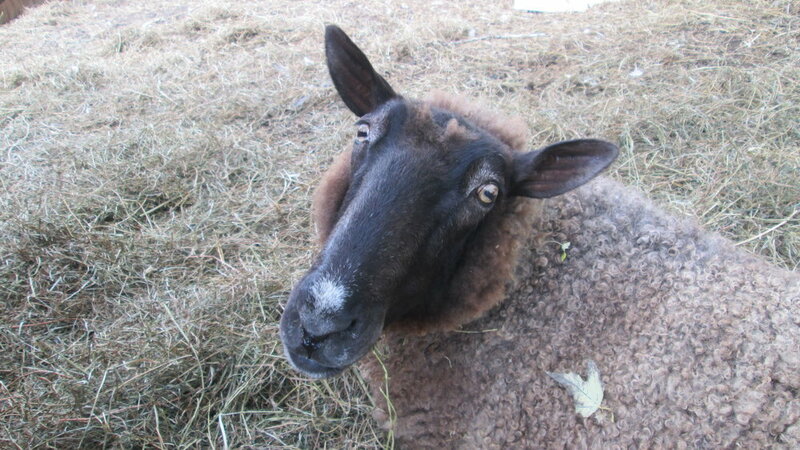 Warrick loves everyone (sheep and people) and is so soulful. He looks and acts like a very deep thinker. He is fourteen years old now. The only thing different about him is the color of his fleece. It has gone from black curls to charcoal gray with sun-kissed cinnamon tips. His curls spin beautifully into our flagship lash yarn (tailspun). I love spinning lash yarn and that is how he generally chooses to have his fleece spun every year. He has yet to ask me to dye his fiber. His best grown up friend is a silly little Romney sheep named Pixie. She is MUCH younger than Warrick and has quite a crush on his handsome self. Their favorite snacks are vanilla wafers, Fruit Loops, pumpkins and apples. All Warrick has ever asked of me is a safe place to graze- and a blanket to snuggle on while I read the sheep a good detective novel. I tell them we are armchair detectives ONLY. Otherwise they would be off trying to be Super Sheep solving crimes in town with sirens a baahing. Bottle lambs never forget the comfort of a soft blanket so I am usually the one who ends up sitting on the grass before the end of the book. Or I have a flat lap from one of them remembering all the times I rocked them to sleep- and think I still should. Warrick comforts me now as I did him when he was a lamb. I swear he’s always had an old soul looking wisely out of those kind eyes. He lived up to that big name. He knows my heart and protects it – in a fortress. A Free knit pattern designed To showcase WarRick's yarn! Purchase Warrick's Lockspun Yarn by clicking on the button below. Supplies are Limited.